Monsters are real, and Hank Jensen has met some of the worst the multiverse has to offer. As a result, he bears the curse of a hateful, malignant god - a horrid disease that has disabled him. Hank fought demons, dragons, and mythical beings to rescue his wife and son, but the battle left the family trapped in the realm of the Isir. 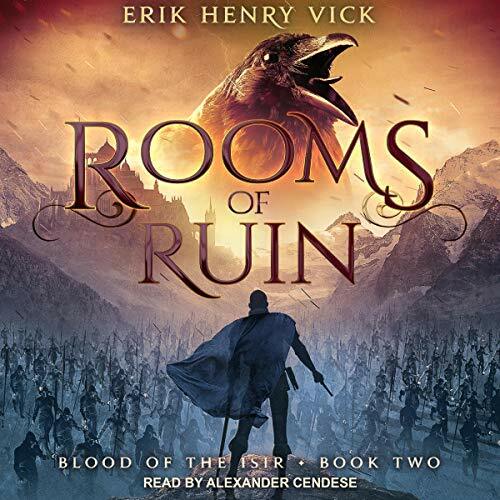 As his dark curse continues to ravage his body, Hank, his family, and his Isir friends must travel to an ancient, faraway place - the Rooms of Ruin - to reopen the pathways that connect the two worlds. But the Dark Queen isn't done with them. She has issued only one command to her servants: drive the Jensen family into the trap she's laid. That's not all she has planned, though. She has a secret plan - someone she's manipulated into betraying them. Will they discover the traitor in time? How will they avoid the Dark Queen's trap? What other dangers await them along their path? First and foremost, the biggest thing I love about this series is the way the author incorporates traditional Norse Mythology and then flips it right on its head! As with the previous book, Alexander Cendese did an excellent job on the narration. He has a good assortment of voices, and is very skilled at manipulating tempo to match the tension at any given part of the story. Easily forgiven (as it's so common) is his limited variety of feminine voices. My one real critique is about vocal inflections. I don't mind when a narrator sometimes goes a different direction than the author intended with vocal qualities and inflections (audio is an adaptation, much like a movie, after all) but in the main they really should try to be true to the author's vision. And Alexander frequently ignores the descriptions given in the text. After the epic scope of Errant Gods, I knew this book would be fighting an uphill battle to top it. And while I don't feel it did so, it has enough added character depth to more than make up for it. Not that this book has a simple plot. Far from it. It is still suitably epic, with large scale battles, intrigue, and plots within plots galore. It just doesn't quite top Errant Gods. However, with the addition of Jane and Sig we get to see a whole other side of Hank that I can't help feeling is strongly influenced by the author's own life. We get to see the playfulness, the joking, the loving banter of a family (and their new, mythological friends) that feels so real that at times it's almost like an intrusion into a real family's privacy. I love the way the author has taken a very real, very debilitating illness and turned it into this fictional character who deals with his pain in such a frustratingly authentic way that I find myself wanting to reach over and smack some sense into him! The progression of the story was a bit of a struggle to follow at times as there are so many things going on, many of them behind the scenes or only hinted at, but in the end everything makes sense as we come crashing into an epic finale. Here I would just like to insert an opinion. I have very little fact to back this up, so please don't think I'm spoiling anything. But I'm beginning to suspect that Hank's character arc is going to end up fulfilling the myths to essentially turn him into Odin. Now, to address the ending. There are some crazy, twisty things that finally come to fruition and end up leaving us with this amazingly epic ending and... I want the next book, dammit! Okay, my temper tantrum is over. Seriously though, we need the next book in audio.